This little guy is hungry and you tell by the way he is calling out for his mom. It is lunch time and the meal machine has wander off in the pasture. Where's Mom, The little calf looks for it Mom hay,it's lunch time. 5x7 oil painting on canvas mounted on a museum quality panel ready to be framed. About This Painting: This painting of sail boats has some impasto work in it, I started with a tangerine sky I wanted a warm color against the cool green of the sea I like the feel of this painting, The added texture brings a little more life to the work. About This Painting:Move over here and give a little kiss on the cheek. Something sweet and something sour so just pucker up. About This Painting: Sail boats sway in the tide at the waters edge. About This Painting: Gulls fly up and down the beach. 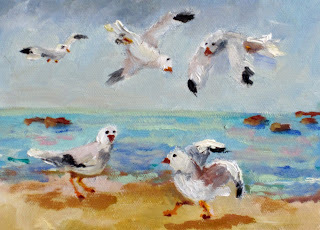 They are always seen at the beach. 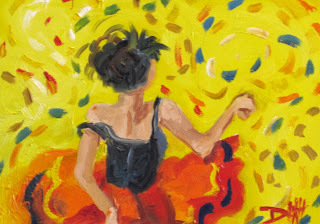 About This Painting: I painted a very large Salsa Dancer and wondered how it would look in a smaller version. 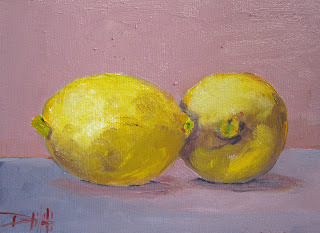 5x7 oil painting on canvas mounted on a museum quality panel ready to frame or place on a small table top easle. How to Purchase: This Painting has been sold. 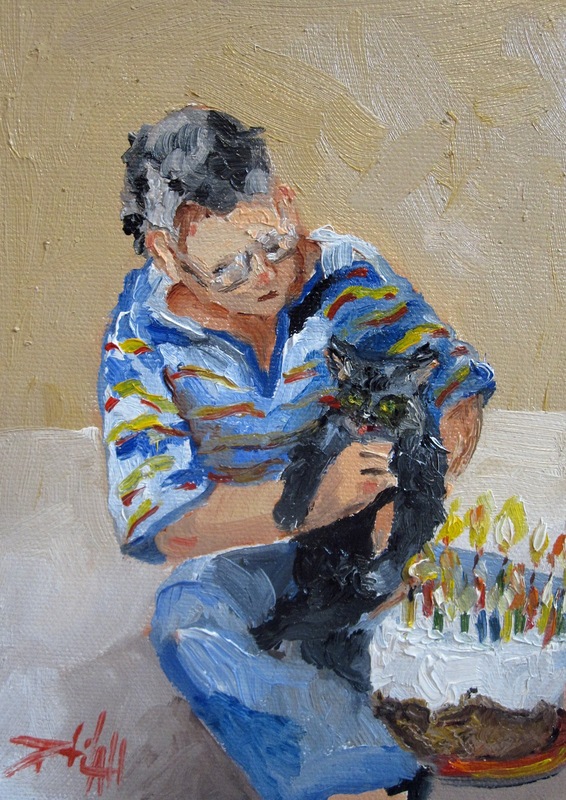 However, I may have similar paintings available. 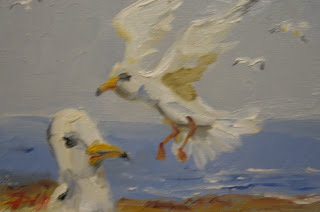 About This Painting: Gulls are such funny little birds. They walk up and down the beach then all head for the same tasty little bite at the same time. They certainly are not quite while they do their little dance. They whoop and holler while having a guy old time. 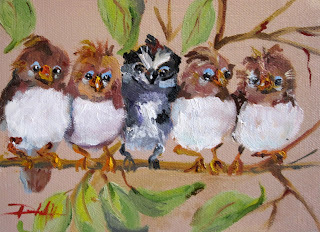 5x7 oil painting on canvas mounted on a museum quality panel ready to frame. 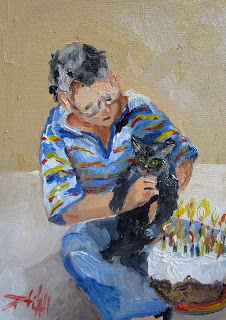 I decided to some impasto work into this painting. I used a palette knife for most of the rose. 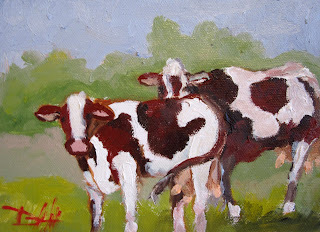 About This Painting: The cow are headed for the barn because it's milking time. As a child one of my jobs was to go back in the fields and round up the cow for milking but most of the time they would already be on their way up the lane to meet me. This is my entry into the Daily Paintworks Challenge. 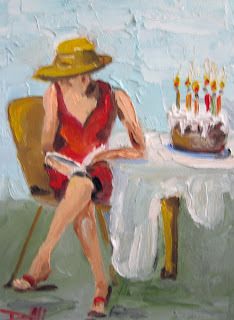 Carol Marine's, birthday just happens to be today, Saturday Aug 13th - yet another anniversary of her 29th birthday. So her husband made a challenge that we paint a painting for her birthday.I thought I would give her a break and let her enjoy her cake and read a book. 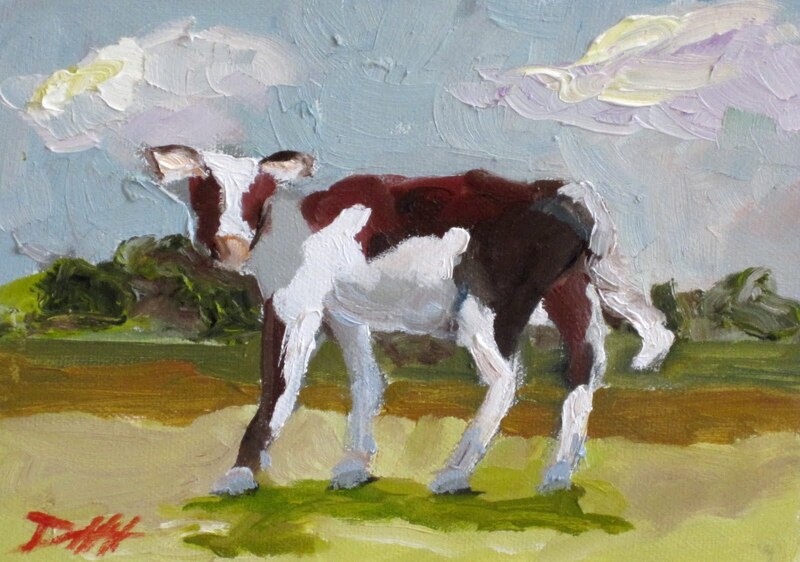 This painting is available Click here to bid. 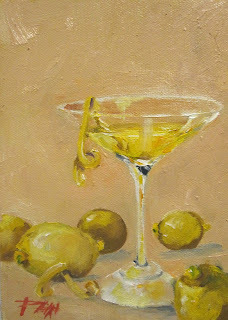 About this painting: When Life gives you Lemons it is best to just squeeze the juice out of them and make a martini relax and this too will pass. To purchase this painting click here. 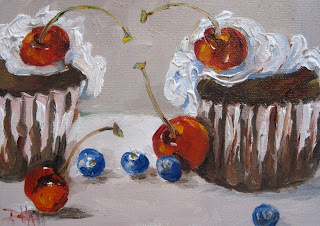 About This Painting: A few sour cherries to make you pucker. 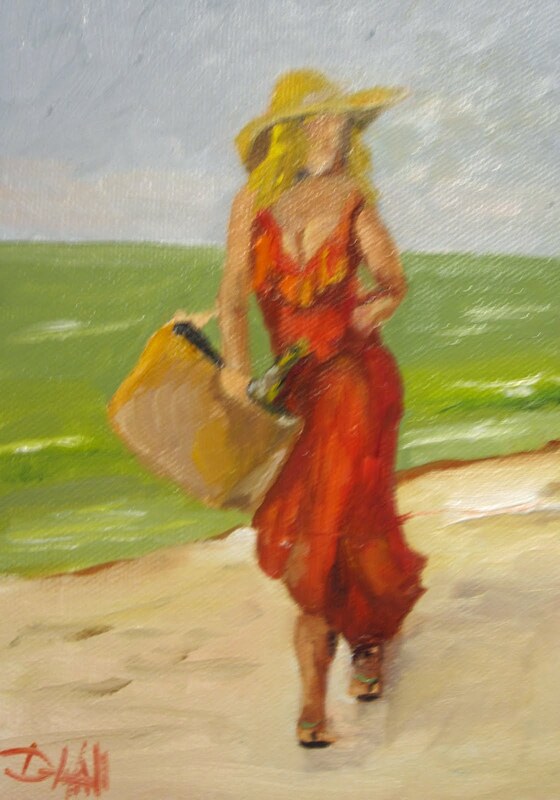 5x7 oil painting on a musem quality panel ready to be framed. A birthday wish someone had a birthday and blew out the candle. I hope they made a wish. About this paint: 7x5 oil on canvas mounted on a museum quality panel ready to frame. 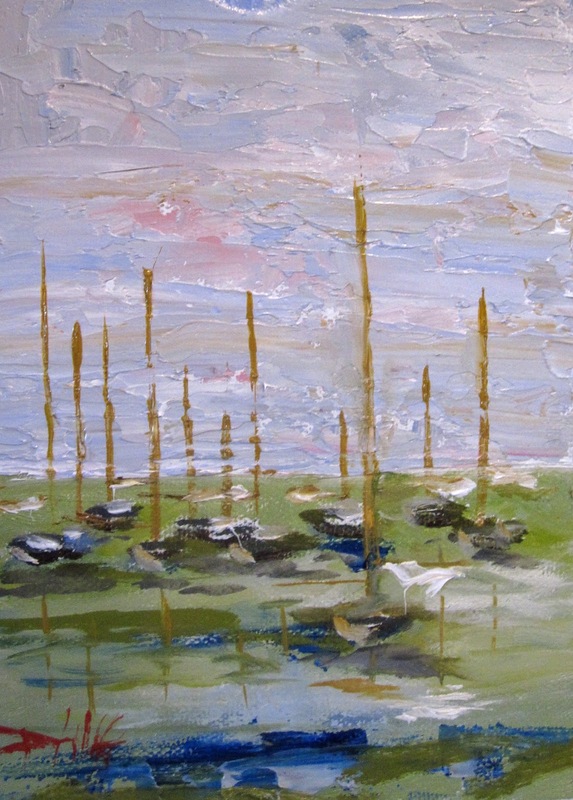 This painting is SOLD however I may have a similar one available for you. 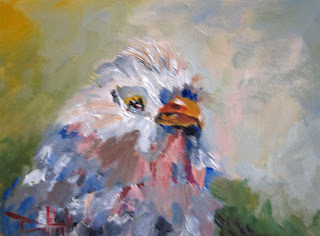 7x5 oil painting on canvas mounted on a museum quality panel ready to frame. 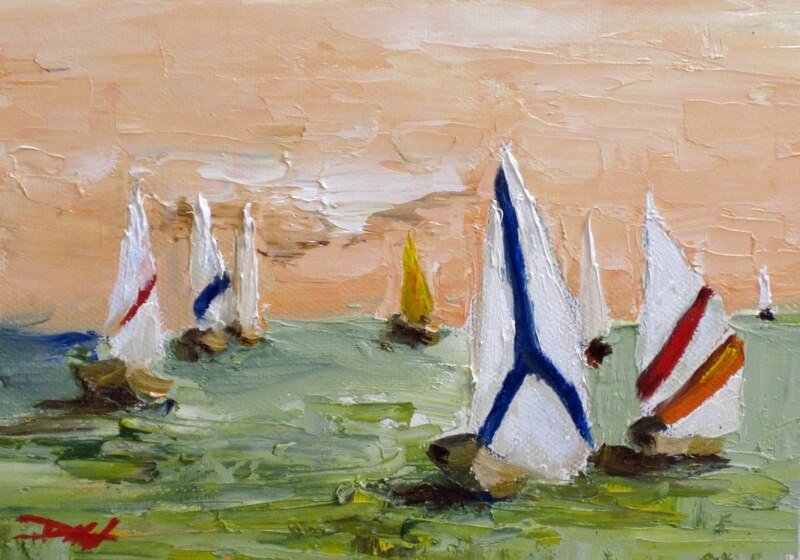 About This Painting: I used a little palette knife work in this sail boat painting. I put some figures into it also. 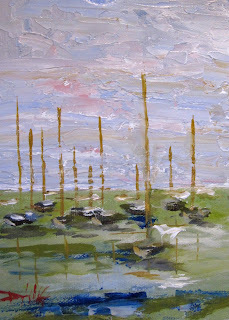 The last few boat painting I have done I have just painted the boats but I wanted to add the indication of people here.This Painting can be viewed at Art Prize 2011. 7x5 oil painting on canvas mounted on a museum quality panel ready to be framed. ABOUT THIS PAINTING: I recently was visiting an art museum and notice the way the artist had very expressionistic painted the dance shoe's on his ballerina's. The shoes were a gray color with just a touch of white making them reflect light like satin. 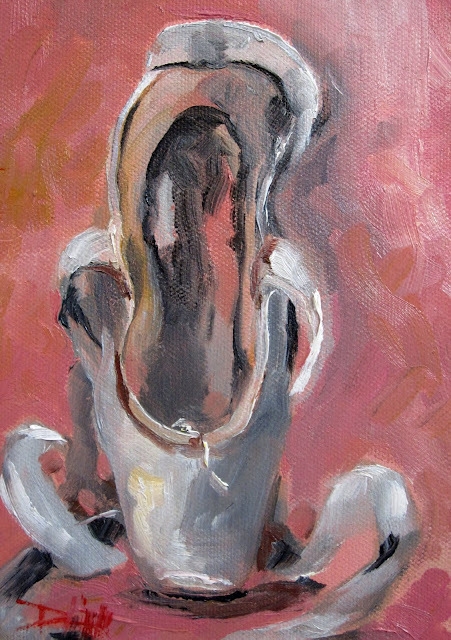 I loved the feel of the shoes and thought I would try to capture a similar look in this work.Click here to buy this painting which is currently available at my Etsy web site Art by Delilah . About This Painting: This oil painting has a glow to it, the way the sunflowers twist and the accent of the blue vase make it pop. 7x5 oil painting of Sunflowers on canvas mounted on a museum quality panel. 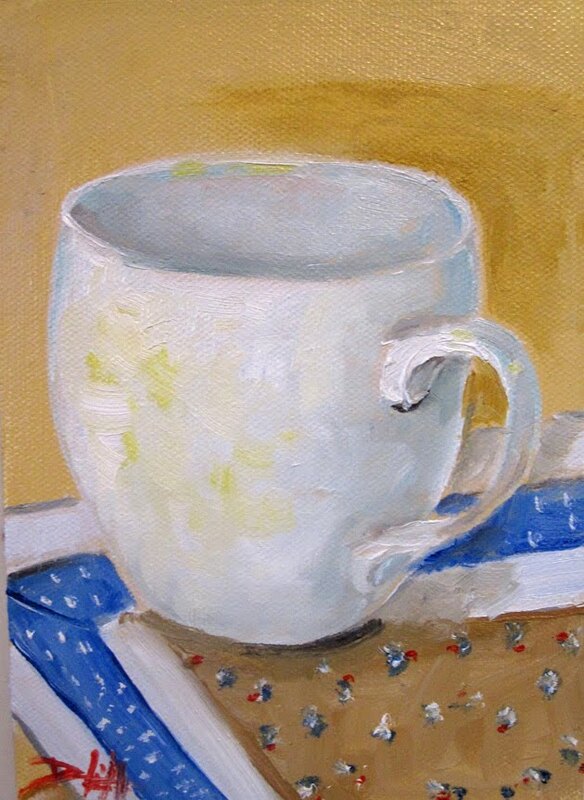 This is the cup I have is not my morning coffee cup, because I can not paint something that I have hot coffee in and keep drinking out of. This is the cup that I have been using for some of my still life set ups. I like it because the white is nice and reflective. I have been trying to get a collection of interesting cup.I you have an old one and would like to see how I would paint it send it to me and I will do a painting of it. 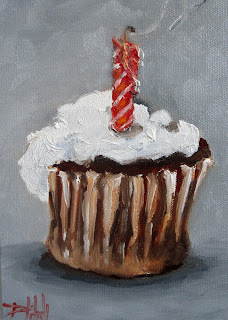 I painted this for the Daily Paint Works Challenge. No, not your face, your mug! As in the favorite cup or mug you reach for when you want something hot to drink. I think what we drink out of tells a lot about our personalities. i.e., my hubby drinks out of a mug with GROG on it. ( He is not a morning person!) Put your cup or mug in whatever setting you would like. If you are worried about drawing the elipse, here is a nice tutorial Can’t wait to see your "mug"! About This Painting:Pour tequila in a highball glass with ice, and top with orange juice. Stir. Add grenadine by tilting glass and pouring grenadine down side by flipping the bottle vertically very quickly. The grenadine should go straight to the bottom and then rise up slowly through the drink. Garnish stirrer, straw and cherry-orange. Woops I forgot the cherry! 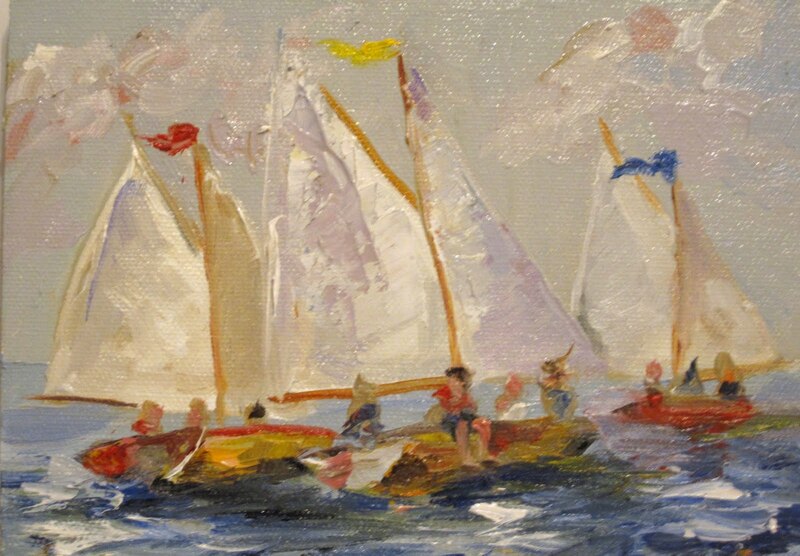 About This Painting: Children playing in the water chase waves, darting in and out, while splashing each other is just a part of summer fun. 7x5 oil painting on a museum quality panelready to frame. About This Painting: Summer is the time to paint on the beach. 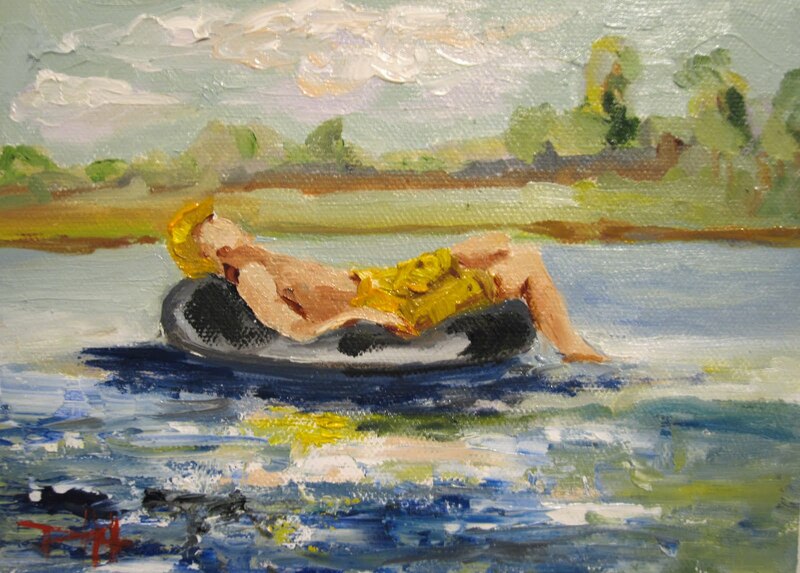 There are a lot of model out there sunning themselves, so it is perfect. 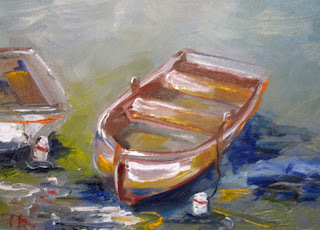 About This Painting: I put lots of interesting brush work in this small daily painting. 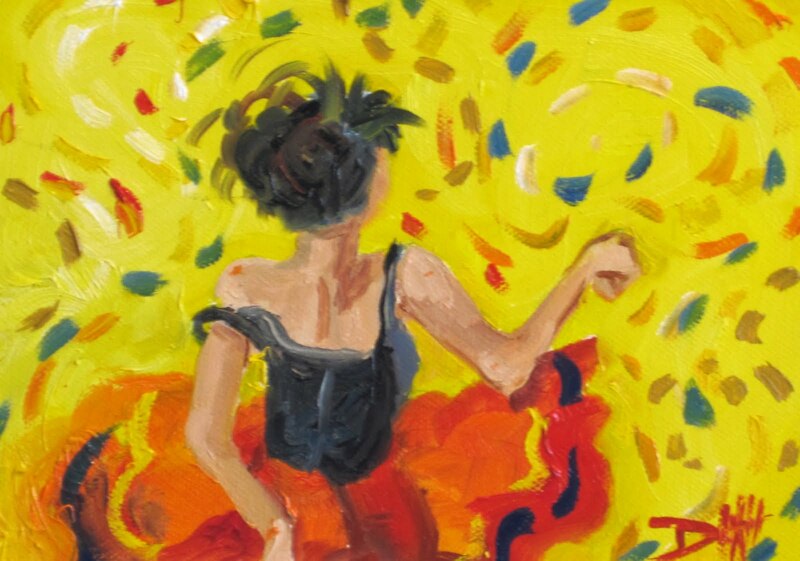 About This Painting:Ballerina practice at the bar, for their next dance. 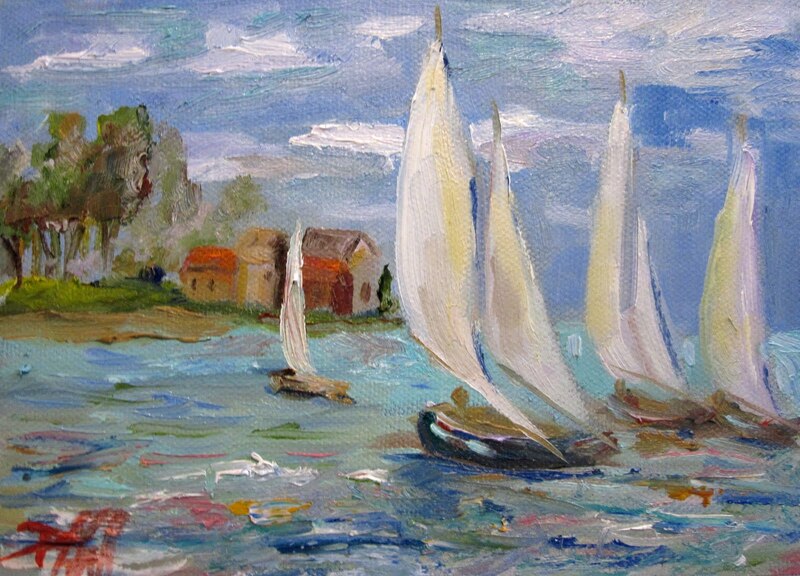 About This Painting: Charter a cruise with this sail boat painting. It is for sale here and you can put it in your Marina.